Richard Blanco Author, "For All of Us, One Today: An Inaugural Poet's Journey". He was selected by the White House in 2013 to be the United States Inaugural Poet. 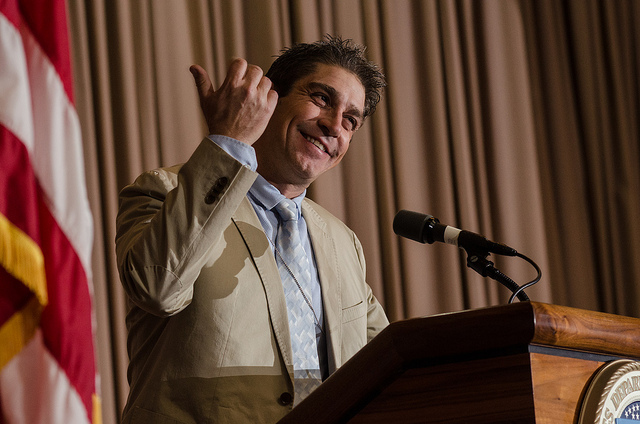 Excerpted from “For All Of Us, One Today: An Inaugural Poet’s Journey” by Richard Blanco. Copyright 2013. Excerpted with permission by Beacon Press. MS. DIANE REHMThanks for joining us. I'm Diane Rehm. Richard Blanco was conceived in Cuba, born in Spain and raised in Miami among a community of immigrants like himself. It's not surprising, then, that his poetry deals with culture and identity. It was a big surprise when the Obama white house called him last December asking him to be the inaugural poet. He charts the journey in his new book titled, "For All of Us, One Today." Richard Blanco joins me to talk about how the experience of being inaugural poet changed how he thinks about writing, America and his role in connecting the public to poetry. MS. DIANE REHMI hope you'll join us. 800-433-8850. Send an email to DRShow@wamu.org. Follow us on Facebook or send us a Tweet. Richard Blanco, welcome to the Diane Rehm Show. MR. RICHARD BLANCOWell, it such a great pleasure to be here -- somewhat of a dream come true, of course. REHMOh, Richard. That's lovely of you to say. What you do say on page 11 of your book "For All of Us, One Today," which is subtitled "An Inaugural Poet's Journey," you say, "To this day, I don't know exactly how I was chosen as inaugural poet." Tell us how it came about. BLANCOWell, as I said in the memoir, to this day I still don't know. It was that phone call. I was driving on the way back home to Maine from just visiting, actually, a middle school in Connecticut. And I just got the phone call through my agent at the time. And, of course, one of my first reactions was one, this must be a prank from one of my friends. But then we Googled the name of the person that called and, in fact, it said presidential inaugural committee. Now, I don't know to this day, and I don't know if that's just sort of the unwritten protocol of this whole sort of selection process. BLANCOI did meet with the president in may in the oval office and he did offer and he said that my work was brought to his attention. And I left it at that. In part, because I think I wanted to keep my romantic version of what might have happened. REHMAnd what was your romantic version? BLANCOWell, you know, just sort of the president absorbed, you know, reading my poems in the oval office -- so completely absorbed that he tells the chief of staff to hold all his calls and -- no matter who and whoever. And then, the other piece would be maybe him sitting around with the first family at dinner reading the poems. And then, you know, dare I imagine him and the first lady perhaps snuggled in bed reading some of my poems. So, in some ways, I didn't pry too much. But I think it's just one of those things that everyone feels better left to just sort of the beauty and mystery of the moment. BLANCOAnd I certainly fall into that category. REHMBut how beautiful the mystery of that moment of receiving that call -- of being told to submit not one, but three poems. REHMHow could you do that very quickly? How long does it ordinarily take? BLANCOWell, you know, usually -- you know, you usually have in, for example, graduate school, a workshop that, you know, you write a -- you get the assignment and you turn it in, in a week. And it's usually a good draft, hopefully. But it certainly isn't the most important poem of your life ever. So just had to sort of simmer down. In a weird way there was about five minutes where I felt oddly comfortable and cautiously confident, because in some ways I had been writing about America in so many ways as a Cuban-American, and those questions of what it means to be an American and whatnot. BLANCOAnd so, ironically, my very first assignment in graduate school by Professor Campbell McGrath was: Write a poem about America. And the poem is titled "America." So about for five seconds I felt, "I got this." REHMI can do this. Yes. BLANCOBut that didn't last very long. You know, you just -- I hunkered down and it's one of those moments in life where you just have to draw on everything you are and everything that, you know, your deepest parts of your creative being and beyond that, just emotionally, to try and do the best job you can. And I gave myself a little bit of breathing room. I said, I'll do one poem a week. And I figured we'd have a good draft. And then -- so, you know, you just kind of -- it's one of those moments in life where you just, you're faced with this great opportunity and you just kind of take it -- the bull by the horns. REHMGood for you. So you did not freeze. BLANCO...after I got the call. REHMBecause I think, you know, it was an opportunity of a lifetime, at the same time you might say, "Oh, my god. What am I going to do?" BLANCOI kept going. And I think a lot of -- as I explain in the new book -- a lot of what's not told is sort of, every time I write a poem, it's also an emotional journey. It's also a spiritual experience in the sense that really that's part of the real, sort of, the real first sort of hurdle is to try and get that right note in your head -- that right moment where your heart and your mind and your soul. And then the poem comes. And a lot of that time was spent in some introspection, questions about my place in America. How I was going to be able to write this poem. BLANCOAnd a lot of, sort of, things came out of the shadows -- questions that I hadn't asked about myself and my place in America. So a lot of the time was spent just thinking about the poem as well as writing it down. REHMTell us about your background, Richard Blanco. It's an interesting one. BLANCOYeah, I -- as I always like to say, "I was made in Cuba, assembled in Spain, and imported to the United States." Which meant that my mother left seven months pregnant from Cuba with me; and then I was born in Madrid; and then only 45 days later, we emigrated to New York and then eventually settled in Miami. So, you know, you can't make this stuff up. You know, sometimes, if that wasn't an ironic sort of foreshadowing of the things that would obsess my work, by the time I was 45 days old, when I think about it, I figuratively belonged to three countries and had lived in two world-class cities. BLANCOSo it's no wonder that later on in life these other things that I would pick up in my writing and, if you want to think about it, even the whole journey of -- it seemed almost everything in my life had been leading up to that moment of reading that poem at the inauguration. BLANCOYes, yes. Along with my older brother, six-and-a-half years older, so. Yeah. Yeah. BLANCOIt was the four of us. REHMAnd did the four of you become citizens very quickly, here in the U.S.? BLANCOPretty much, I think. First, we obviously became residents. And then eventually -- I actually didn't become a citizen until I was 17. I don't know exactly the reasons why. But it was funny because we -- we were a working-class family, so we didn't go on vacation. I mean we didn't travel out of the country very much. And one time we decided to take a cruise to Mexico. So we contacted the Spanish embassy and they said, "Well, he's not a Spanish citizen," because in Spain you actually have to apply for citizenship, even though you're born there. BLANCOSo, for the first 17 years of my life, I was a citizen of the Atlantic Ocean, maybe, I guess. I'm not sure. So, but eventually we, you know, I think it was the exile and immigrant work ethic, we fell right into, you know, adopting this country -- always with a nostalgic eye, of course, of Cuba and that exile mentality of still there's this sense that some day that paradise that we'll be, that we'll go back to someday. But, certainly, it was an ironic -- as I witnessed it in my community -- it was this incredible sort of, as you know, the Cuban community just fell right into sort of the fabric of Miami, especially. BLANCOBut there's always this nostalgic eye sort of looking back saying, "Well, we're going to be a success here. We're going to put our best food forward. But someday we might go back." REHMIs that why your family moved to Miami to begin with? BLANCOWhat was -- excuse me? REHMDid they move to Miami because they wanted to be part of that Miami-Cuban community? BLANCOYes, I think, in the early years, in the 70s, as far as I understand -- of course, I was just a little baby -- but Miami, of course, there wasn't as many opportunities as there was up in the North, in New York, obviously, and the Northeast. So it wasn't until I was four years old, in 1972, that they that Cuban community started really growing. And also it was a support system. And that's part of what is echoed in the inaugural poem "One Today." BLANCOAnd part of my inspiration is that tight community that I remember us always sort of supporting each other, helping each other, understanding that each one -- each person was part of a larger whole. And that we had to stick together to survive. So it was a place that felt more like home. Of course, the weather helped as well. But, yeah, it was a lot easier. But Miami had to expand a little bit before we were able to sort of have more opportunities. REHMDid any other relatives join you? BLANCOOh, yes. I mean, in New York, it's kind of a typical sort of movement pattern of Cubans. There was a lot of Cubans in the early -- late 60s and early 70s in New York. And eventually we all started traveling -- relocating down to Miami. And then, by the time I grew up -- I grew up around my, basically, mostly my entire family, the relatives and uncles and aunts and all that. So it was, they were all there. Yeah. REHMWhat about traveling to Cuba? Have you had an opportunity to do that? BLANCOCertainly. I've gone about five or six times by now. You know, it's interesting, because when I first started writing -- and I didn't start writing until I was in my mid-20s -- I started exploring my whole idea of cultural identity and navigation. And the next step, of course, seemed logically to travel to Cuba. And it was one of the most amazing experiences, in part, because you grow up with all these stories and all these letters and photographs. And they're all ghosts, but they're family. They're this part of you. BLANCOSo the best I can always describe it is that going to Cuba was like stepping into, you know, those children's pop-up books, where suddenly your life, all these memories and things become three-dimensional. And it was just sort of filling in all the blanks of all these stories and neighbors and relatives and landscapes. REHMRichard Blanco. His new book, "For All of Us, One Today -- An Inaugural Poet's Journey." Stay with us. REHMAnd welcome back. If you've just joined us, Richard Blanco, the individual who had both the wonderful good fortune to be selected to be President Obama's inaugural poet this past January and my guest today, he has a beautiful book out, a memoir. It's titled "For All of Us, One Today: An Inaugural Poet's Journey." As he said at the start of the program, he was conceived in Cuba, born in Spain and then came to live in the United States, first in New York and then in Miami. REHMI've asked him to read for us a portion of his "Inaugural Poet" and then we'll talk about some of the events leading up to it, Richard. BLANCOThank you, Diane. One Today. One sun rose on us today kindled over our shores, peeking over the Smokies, greeting the faces of the Great Lakes, spreading a simple Truth across the Great Plains, then charging across the Rockies. One light waking up rooftops. Under each one a story told by our silent gestures moving behind windows. My face, your face, millions of faces in morning's mirrors, each one yawning to life crescendoing into our day. Pencil yellow school buses, the rhythm of traffic lights, fruit stands, apples, limes and oranges arrayed like rainbows begging our praise. BLANCOSilver trucks heavy with oil or paper, bricks or milk teeming over highways alongside us on our way to clean tables, read ledgers or save lives, to teach geometry or ring up groceries as my mother did for 20 years so I could write this poem for us today. All of us, as vital as the one light we move through, the same light on blackboards with lessons for the day, equations to solve, history to question or atoms imagined. I have a dream. We keep dreaming or the impossible vocabulary of sorrow that won't explain the empty desks of 20 children marked absent today and forever. BLANCOMany prayers, but one light breathing color into stained glass windows, life into the faces of bronze statues, warmth onto the steps of our museums and park benches as mothers watch children slide into the day. REHMI can remember having tears in my eyes as I watched you read that poem and I feel the same way today. It's so beautiful. BLANCOThank you, Diane. Thank you. REHMAnd of course the Newtown shootings you refer to in this poem. BLANCOYes. What happened was, you know, as I was sort of going through the emotional inventory of writing the poem and of sort of connecting with what I was going to do in the poem and, you know, what was the angle. And again, writing a poem made me ask a lot of deep questions. One was, you know, as an immigrant there's always a little piece of you that says, well you're not quite American or, you know, not 100 percent or America's some other little boy on TV. BLANCOAnd so I was -- had to ask those questions honestly to write an honest poem. And I was going through that emotional inventory. And in the midst of all that -- in the midst of all that the tragedy happened. And I realized, as we all did -- I mean, we all wanted to just go there and hug these parents and these children. And I realized that this is my country, that this is my family. And I remember watching the services also and seeing the president with tears in his eyes and that beautiful service in, I think like, three or four different traditions of faith. BLANCOAnd I said, these are the moments that really capture, unfortunately a lot of times in tragedy but that capture what the American spirit was about. And I felt so much a part of that that it opened up this emotional door for me to say, this is my country. You know, I can write this poem. I am American. I am part of this family. And so that's why I chose at that very moment that I knew I had to represent those children in some way shape or form in the poem for them to live forever in the poem. REHMSo it really did change the trajectory of your thinking, your writing, even your performance. BLANCOYes, certainly, certainly. It opened again that door that let me connect with America in a way I hadn't perhaps thought about in a while, and realizing that, you know, I really do care about this country and that I am patriotic in a way that I had forgotten. And that filled in more as I actually read the poem and was sitting on the platform. But again, what this book is about is that whole emotional journey of, you know, a poem is not just sort of a creative challenge, but it's also an emotional challenge. BLANCOAnd it was that tragedy that opened that door that triggered that connection with me in a way -- within a powerful emotional way that I think showed in the rest of the poem, all of us were there. REHMI want to back up because early on we said that you were asked to submit three poems. REHMYou sent in what, one at a time or all three? BLANCOI sent two in at a time. The first one I wrote, which is in the book -- and these have never been published, the other two, so I'm very excited about them -- was "What We Know of Country. And that was the first one. And that I've seen now that was almost a precursor to "One Today" because it's a poem that centers around this idea of paralleling -- or creating a parallel between the loving human relationship and our relationship with our country and sort of the phases we go through some innocence to infatuation to frustration, betrayal, anger and then forgiveness and finally coming to a mature end of love. BLANCOAnd so that was the first moment I submitted that. And then I wrote one today which was triggered more by the Sandy Hook tragedy and of course other elements. Poems are complex. A lot of things go into them. BLANCOSo I submitted those two. They -- the White House, in their language they say, we prefer one today. So I said, okay. And they liked it. They loved it so I was like, okay, at least I got one down. So then I went on to the third poem, which I said -- well, I gave myself a little more room. And it's a poem -- it's a poem called "Mother Country" and it sort of places the reader and myself in the emotional shoes of my mother's sort of exile out of Cuba and asked the readers to ask themselves this question, which is in the poem, which is to love a country as if you're lost one. BLANCOAnd I think if we take a step back and think, if you had to get on a plane tomorrow right out of your city and turn your back and say, I will never see this country again, how might we think about and appreciate where we live a little bit differently. And so the "Mother Country" poem became my favorite actually because it's a poem I knew how to write. It's about my mom -- you know, it's about mama, you know. It was a poem that was more of a typical Richard poem. But then it was actually with conversations with several friends, including Julio Alvardez (sp?) who really -- you know, who really had some great advice. BLANCOAnd then we saw the light that "One Today" was really the poem for the occasion. And then I just went back to it and revised it. And that was part of sort of the creative -- the big creative lesson I learned that a Richard Blanco poem is not a Richard Blanco poem because of what I write about, but because of how I write about it. And so I realize all I had to do with "One Today" is approach it with the same love and the openness and the intimacy that I would as if I were writing a poem about my mother. So I embrace the poem in a different way and then it really became my favorite. REHMYou know, it's interesting how we who live here in this country feel so free to criticize what our country is. And perhaps we criticize more what our government is. Do you think that you, as part of who you are, feel somewhat differently about this country than perhaps someone who was born here who's lived here all their lives? Do you bring a different sensibility? BLANCOI think I do and I think immigrants in general do, and my mother being an example. And myself as an example having grown up even as I did get here when I was 45 days old but still, I missed being able to be president by 45 days. But, you know, in examining in particular that poem, my mother made me realize that my mother is more of an American than I could ever be, because it wasn't a story about courage, about leaving -- although that's part of it, but the incredible faith she must've had in this country to make that leap of faith. BLANCOAnd so as I've witnessed in the community, we don't take those -- in my exile community we don't take those freedoms for granted. And we hold America, you know, a higher standard say, we did all this so we're constantly sort of -- our eyes always on the great things about America. And I think that sometimes, myself included, we tend to forget that. BLANCOAnd the inaugural experience and everything that's happened including -- my mother grew up in a dirt-floor home in Cuba and was sitting next to me on that platform within arm's reach of the President of the United States. And I don't know that that could happen in any other country. BLANCOAnd so I've -- through the process I've also realized, let's not throw out -- you know, to use a cliché, let's not throw out the baby with the bathwater, that I think in our effort to be critical. And we should be and we should be vigilant, but that we tend to forget some of the great founding ideals that are still intact in that we're still -- we have to work for them. It's true, but isn't that what life is all about? An ideal is something that may never be fully achieved but isn't it great that we get to be part of that story, that we get to write that story, that we get to participate in a democracy that pushes that forward. BLANCOBut sometimes I think we lose that light at the end of the tunnel. I know I have sometimes, you know. You know, you get lost into sort of just the negativity of things that are happening. And we're living in a time where just certainly there's a lot to criticize I think. But I think that perspective of just that dream that still is in our hearts as immigrants is certainly a unique perspective. REHMAnd you're listening to "The Diane Rehm Show." "There are a number of callers. Let's open the phones, 800-433-8850. Let's go first to Michael in Hialeah. Fla.
REHMHi, Michael. How are you? MICHAELHi, Diane. Thank you for taking my call. MICHAELMy question is for Richard. Richard, I'm sure you know that -- where Hialeah's from and the interpretation that Hialeans in Miami or South Floridians in general have of America is obviously quite different than anybody outside of Miami. And so my question to you is, at what point did you realize that Miami or South Florida was not exactly the same America that you envisioned, you know, when you moved away? BLANCOOh my gosh, certainly. As I always like to say, growing up in Miami, I lived between two imaginary worlds of course. One was the Cuba that was in our parents and families, that 1950s, '60s Cuba that was this amazing place, but we had never been there. And the other one, the way my concept of America was formed because Miami was so sort of culturally insular and everybody was Cuban, the neighbor was Cuban, the schoolmates were Cuban, the mechanic, the doctor and the lawyer. So it was a completely Cuban or Latino community. BLANCOHow I formed my concept of America was basically through sitcoms and Brady Bunch. And they're still like my favorite version of America. And so I thought America was also someplace else. So as I always like to describe my Miami, at least where I -- how I grew up was sort of a cultural purgatory, which is a waiting ground between the real imagined Cuba and the real imagined America, that we grew up always sort of yearning as well. So it was navigating those two worlds and someday reaching one or the other. BLANCOAnd of course eventually I moved up to New England and of course I realized that that was a fantasy. You know, that it wasn't that way, in the same way that when I went to Cuba I also realized that I couldn't step back into my parents' 1950s and '60s Cuba. And that was sort of an illusion as well. So yeah, that's definitely a unique -- I think anyone that grows up in South Florida and Miami in general has that otherness that, you know, it's America -- or I think it was Liz Balmaseda, the Pulitzer Prize-winning journalist that said, we love living in Miami because it's so close to the United States and you don't need a passport. REHMRichard, I also wonder about your feelings on being described as the first gay poet to read at the inauguration. BLANCOCertainly, certainly. You know, it's interesting because they've used the term openly gay and I always have to chuckle with that because it seems redundant if I wasn't open by the time they announced the inauguration. You know, it was sort of -- it was just part of the -- how could I say -- the wholeness of me, the complexity of me. You know, I have this concept of what is cultural sexuality so that you can't separate who I am as Cuban as who I am as a gay man as who I am as an engineer and a poet. And that all sort of happens together to create the complexity of any human being, and my complexity in particular. BLANCOI don't -- you know, I have a debate that a lot of people resist labels and I'm not sure why because I would understand that this is all that would be talked about. But certainly I am that person. I am the first openly gay person. I am -- the first Latino. I am these things. I don't want anybody to take those stories away from me. Now, if you're going to stereotype me, that's another story. REHMThere you are. Richard Blanco. His new book "For All of Us, One Today." Short break and when we come back, more of your calls, your email. I look forward to speaking with you. REHMWelcome back. If you've just joined us the man who read the beautiful poem at President Obama's second inauguration, Richard Blanco, is here. His new book, subtitled, "An Inaugural Poet's Journey," is titled, "For All of Us, One Today." There is a beautiful poem, Richard, I'd love you to read for us. It's titled, "Mother Country." And I know it is about your mom. BLANCOCertainly. And this was, of course, the third of the three. "To love a country as if you've lost one. 1968, my mother leaves Cuba for America, a scene I imagine, as if standing in her place. One foot inside a plane destined for a country she knew only as a name, a color on a map, or glossy photos from drugstore magazines. Her other foot anchored to the platform of her patria. Her hand clutched around one suitcase, taking only what she needs most, hand-colored photographs of her family, her wedding veil, the doorknob of her house, a jar of dirt from her backyard, goodbye letters she won't open for years. BLANCO"The sorrowful drone of engines, one last deep breath of familiar air she'll take with her, one last glimpse at all she'd ever known. The palm trees wave goodbye as she steps onto the plane. The mountains shrink from her eyes as she lifts off into another life." REHMAnd you and I share that since my mother came to this country without any of her friends, relatives, whereas my father came here with his entire family. Loneliness had to have been a great part of her life. BLANCOYes, certainly. And it's similar in my case. My father also came with his entire family. BLANCOAnd we remember, even as children, sort of picking up on that loneliness, on that sense of desperation. I will never forget the day that my mother received a telegram. I remember her, she reading it at the kitchen table, announcing that her mother had died, and locking herself up in a room for three days. Hadn't seen her and wasn't able to go back then to Cuba, even to attend a funeral or see her grave or anything. So I think that I picked up on that. I think as a sensitive child, as the poet or artist that I would be, I always sort of picked up on that. And in many ways, my mother plays a very central role in my poetry because I've always wanted to heal her. BLANCOI've always wanted to give her back everything that she lost. And it's certainly a muse. And she is a character -- don't get me wrong. I mean she also says jokingly that she should get royalties for all the inspiration that she's given me in my life. But an incredibly complex, courageous, amazing woman. And I think what she did to avoid some of that loneliness and falling into deep depression was she became very much a go-getter. And she made sure that our time here in America was well spent, focus on education, making sure we made it, making it all happen because it was the only thing she had, was to -- at least as she was here, I think she wanted to make the best life possible for herself and for us and for our family. REHMHow did your father earn his living once you got here? BLANCOMy father was actually a Navy man in Cuba. And he was a port pilot. And then, of course, like most exiles and immigrants, they have to change jobs and do what not, so he actually learned by trade to be, basically, a bookkeeper, through my grandfather that had also learned as a trade. And so he worked eventually for a company for several years, for several decades in Miami, you know, steadfastly providing for the family. REHMAnd your mother helped to provide as well? BLANCOAnd my mother worked since I can remember. And there was dinner on the table every day at 5:00 o'clock. And we used to call her the computer because she knows everybody's -- she's like a time, you know, she's got everything timed and she knows everybody's birthday. She'll wake up and say, today is so and so and so and so's birthday. But my mother worked, first, as in the poem, as a checkout girl at my uncle's grocery store. But eventually she worked as a bank teller, but she was actually a PhD -- not a PhD. We call it an EED or the equivalent -- she was a teacher in Cuba. BLANCOBut because of the language barrier she never picked it up again. And she's been working, again, at the bank for about 30 years now. REHMWow, so you're still very close to her? BLANCOOh, definitely. Yeah, she still lives in the house I grew up in. REHMWonderful. Wonderful. All right. We've got a caller in Annandale, Va. Hi there, Nancy. You're on the air. NANCYGood morning. And thank you so much, Diane. I was so excited to hear this gentleman was your guest today, that I actually stopped my holiday cookie baking extravaganza just to sit down and listen. NANCYYou know how people ask do you remember where you were when? Well, I remember that moment during the inaugural so well. I remember I almost stopped breathing. It was so touching, so real. And I don't know why I remember it so well. I'm still emotional now, you can hear my voice. But I think it may have been because I'm from an immigrant family, too. But I think it was because it renewed my love of poetry. And I scoured the Washington Post the next day for a copy of it and was so disappointed not to find it. NANCYOf course eventually I did and I still have a copy of it. And I want to make a comment about, you know you mentioned something about that romantic moment you didn't really want to delve into why President Obama chose you or the committee chose you. I knew President Obama long before he was president. And I suspect that he might have read some of your work during one of his late night readings and just said, I like this guy. Let's get him for the inaugural. REHMI think that's a lovely thought. BLANCO…letters from thousands of school children, letters from everyone from military men to people in nursing facilities, just the ability of poetry to connect people, to be that fire in the campfire that we can sit around. REHMDid you get any negatives? BLANCOWell, I don't know if my partner, Mark, had because of course the emails -- we crashed like three Gmail accounts from messages coming in. BLANCOSo I don't know if they were protecting me, but surprisingly, Diane, that was one of the most surprisingly wonderful things because I thought, you know, all those hats I had on, I thought, well, there's going to be a lot of hate out there. Everything seemed to be completely positive and very similar to the caller's message of feeling the sense of included for the first time in their lives in America, feeling this sense of belonging, of togetherness for those three to five minutes, at least. REHMAnd tell me how your life has changed since then? BLANCOWell, it's changed in many, many ways. One was the outcome, the emotional outcome of all of this is sort of this sense that I've, again, you know, a lot of my work has been about what's home, what's belonging, where do I belong, you know, where is that magical place. And I realized that home was here all along, that it was in my backyard. And I realized that this is where I belong. This is the country, as my mother says at the end of that poem, this is -- one is not from where one is born, but from where one chooses to die. And this is the country I will die in. So that was one thing that was life changing. BLANCO…all sorts of advocacy groups, and being asked to write more occasional poems. It's just amazing. Something -- I think there's been a tipping point, somewhat of a small tipping point, but a tipping point with poetry in America. So people are asking me, commissioning me like a sculptor, to write another occasional poem, for example for the Freedom To Marry organization, for the Tech Awards, which I just finished now in Silicon Valley this past week, for the Boston Strong poem, which was another moment of reading a poem in America. BLANCO…not only is there a place, there's a hunger for poetry in America. We just have a lot of misconceptions about it. And I think we have to rethink about how we teach poetry. REHMAnd even as we speak about poetry, you're here in Washington, where politics is always undergirding everything that happens here. And as you well know there's a current disagreement between two very prominent sisters, the Cheney sisters, about whether gays should be free to marry anywhere in the country. If you could speak to the two of them, what would you say? BLANCOWell, I think, you know, as the poem, "One Today," describes, I think if we really stop and think about how we can come together, I think that's the most important thing. I think it's the idea that each one of us, no matter how different or whatever, we bring something to the table. That's certainly the idea. And the vision of moving forward to me is that America, I think we'll get there. I think that we need to understand that everything's a battle and that's fine and there's a discussion. And at the end of the day we have to look towards those ideals. And I think that was in Obama's speech in the inauguration. BLANCOWhat do those ideals inform us to do? What that will tell us to do what is the right thing at the end of the day. And I think, you know, my vision for the poem -- and I could have written a poem that was much more politically charged, that was a temptation at one point. But I think we have to hold that vision of what is the -- and I think our hearts know what is the vision of America. It's still in our hearts and that is about coming together and really the ideals, let's read them, because they will tell us what to do. REHMAnd you're listening to "The Diane Rehm Show." Let's go to Adrian, who's in Miami, Fla. Hi, there, Adrian. ADRIANHello, Diane. I'm so glad I finally got to get in contact with you. ADRIANI always listen to the show on Tuesdays because I have to do a courier trip from my office, so it's always wonderful. ADRIANFor Richard, I wanted to ask you how -- well, I guess let me start off, I was born and raised in Miami by Cuban parents. But I never really left Miami. And I never realized that it was a cultural microcosm in the United States until I left Miami on a trip to Washington, D.C., where I spent a week with my school on a trip learning about Washington, D.C. and the government and how things work. And I actually got to spend time with people from other parts of the country and I realized, wow, Miami isn't the United States. ADRIANSo I wanted to ask you, did you ever have an ah-ha moment, a point in your life where you realized the uniqueness and the difference and yet what makes us different, but what makes us the same? Thank you. BLANCOWell, certainly. I remember I got a job in the county just north of Miami-Dade County, when I was working in engineering. And suddenly there was no Cuban coffee to be had anywhere around there. And I thought, oh, my God, I've entered into a new territory. That's a funny anecdote, but it really was sort of just my first sort of dawning into realizing that even just north of the county line that there's another America. But I want to tell you this, too, that there are so many of those microcosms in America. BLANCOI mean, go to San Antonio, I mean go to Santa Fe, come to Maine, I mean, that's what makes this country so amazing, that there's all these sort of microcosms, these micro communities. And my feeling is that that's really part of the essential spirit of America, is that we can have all these sort of great different microcosms, different micro communities and yet we're all American in some way. That's the glue that binds us. So that's the realization I've come to over the years, but especially fairly recently, through my experience as the inaugural poet, was that as I travel around the country I'm just so in awe of how many different communities and wonderful spaces and people doing amazing things in their own way. REHMRichard Blanco. His new book, which includes of course his beautiful inaugural poem, is titled, "For All of Us, One Today: An Inaugural Poet's Journey." Richard, so good to be with you. Keep writing. BLANCOI'll keep doing my work as long as you keep doing your beautiful work. REHMThank you so much. Thanks for listening all. I'm Diane Rehm.